Blocked after drilling down only one foot instead of fifteen, engineers are increasingly worried that they will not be able to get InSight’s heat probe past whatever is blocking to so it can begin getting data of Mars’s inner thermal environment. They are considering a bunch of options, including using InSight’s robot arm to either give the probe a nudge to help it get past the obstruction, or even use the arm to push the probe. None of the options are encouraging it seems. Engineers have called a pause in InSight’s drilling operation to insert a heat sensor as much as 16 feet into the Martian soil because it appears the drill has hit a large obstruction. When these facts were first reported on March 1st, the press release did not make it clear at that time that the hammer drill was actually blocked. If it cannot drill down further, this will put a crimp in the heat sensor’s ability to measure Mars’s internal temperature. Right now it is only about a foot down, which on Earth would still have it influenced by surface temperatures. The German-made heat sensor hammer that the U.S. lander InSight placed on the Martian surface has begun hammering its heat sensor into the ground. 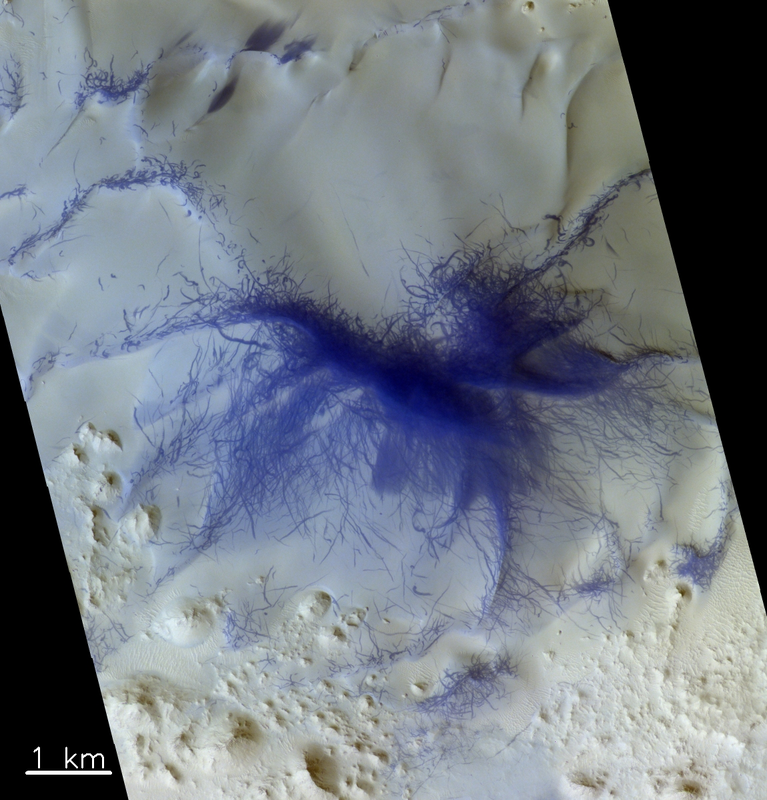 On 28 February 2019, the German Aerospace Center (Deutsches Zentrum für Luft- und Raumfahrt; DLR) ‘Mole’ fully automatically hammered its way into the Martian subsurface for the first time. In a first step, it penetrated to a depth between 18 and 50 centimetres [7 to 19 inches] into the Martian soil with 4000 hammer blows over a period of four hours. “On its way into the depths, the mole seems to have hit a stone, tilted about 15 degrees and pushed it aside or passed it,” reports Tilman Spohn, Principal Investigator of the HP3 experiment. “The Mole then worked its way up against another stone at an advanced depth until the planned four-hour operating time of the first sequence expired. Tests on Earth showed that the rod-shaped penetrometer is able to push smaller stones to the side, which is very time-consuming. They will let the hammer cool down for a few days, and then resume hammering. If all goes well, they hope to get as much as 16 feet down. InSight has successfully deployed its temperature instrument onto the Martian surface, where it will next begin drilling its heat sensor about sixteen feet down into the ground. Equipped with a self-hammering spike, mole, the instrument will burrow up to 16 feet (5 meters) below the surface, deeper than any previous mission to the Red Planet. For comparison, NASA’s Viking 1 lander scooped 8.6 inches (22 centimeters) down. The agency’s Phoenix lander, a cousin of InSight, scooped 7 inches (18 centimeters) down. Whether the spike will be able to get to 16 feet will depend on many factors, such as whether a rock below the surface happens to be in the way. InSight has successfully placed its first instrument, its seismometer, on Martian surface. They aren’t yet ready to start gathering data, however. They plan on deploying the heat probe (which will drill down about 16 feet) in January. The high resolution camera on Mars Reconnaissance Orbiter (MRO) has located and photographed InSight, its heat shield, and its parachute. The pictures themselves are not very interesting. What is important however is for scientists to know exactly where InSight is located so they can better understand the data it sends back of Mars’ interior. They now have that information. InSight has unfolded its robot arm and is beginning to use it to photograph the surrounding area to figure out where to place the spacecraft’s ground-sensing instruments. But first, the arm will use its Instrument Deployment Camera, located on its elbow, to take photos of the terrain in front of the lander. These images will help mission team members determine where to set InSight’s seismometer and heat flow probe – the only instruments ever to be robotically placed on the surface of another planet. They are proceeding carefully, so actually deployment might not occur for several months, just make everything goes well. NASA engineers have received confirmation that InSight has successfully touched down on the Martian surface. Don’t count your chickens yet. They need to wait about five hours for the dust, kicked up by landing, to settle before they try opening the solar panels. That must succeed, or the mission will fail, having no source of power. The landing information was relayed through the two MARCO cubesats flying past Mars, a landmark engineering achievement that in a sense is more significant than the landing itself. These cubesats have demonstrated that smallsats can do complex interplanetary tasks. Expect a revolution in the planetary space exploration world. InSight, NASA’s next Mars lander scheduled to launch later this year (two years late), is aiming for a landing site in a region called Elysium Planitia, a flat plain north of the equator. InSight’s scientific success and safe landing depends on landing in a relatively flat area, with an elevation low enough to have sufficient atmosphere above the site for a safe landing. It also depends on landing in an area where rocks are few in number. Elysium Planitia has just the right surface for the instruments to be able to probe the deep interior, and its proximity to the equator ensures that the solar-powered lander is exposed to plenty of sunlight. The target area is centered at 4.5 N latitude and 135.9 East longitude. If you zoom in on that latitude and longitude at the archive of Mars Reconnaissance Orbiter (MRO) high resolution images, you get the red blob on the right, which shows how many images they have taken of this area in preparation for InSight’s mission. The X indicates the location of lat/long above. Below the fold is a reduced version of the MRO image for the center of this target area. The black spots near the center are thought to be a recent crater impact site. In general, this image shows an area with more features than the region around it. Most of the landing area of Elysium Planitia is a featureless flat plain with scattered small craters. Since InSight is not a rover, where it lands will be where it does its research, so there was no reason to pick a site with lots of interesting surface features. Moreover, since InSight is focused not on studying the surface but the interior geology of Mars, it matters little what the surface looks like anyway. One instrument will be a seismograph, while another will insert a thermometer about sixteen feet into the ground to measure the interior temperature. NASA has now set 2018 as the new launch date for its Mars InSight mission. The mission was originally supposed to launch in 2016, but missed that launch window when significant problems cropped up during construction of the spacecraft’s French-built prime instrument. NASA has now taken much of the responsibility for building that instrument away from the French and given it to JPL. The cost for the changes and reschedule is estimated to be more than $150 million, adding to the budget strain in NASA’s science programs already caused by the overruns from the James Webb Space Telescope. NASA now estimates that it will cost about $150 million to delay the troubled InSight Mars lander two years until 2018 in order to fix the spacecraft’s primary instrument. The extra money has to come out of the planetary program, which suggests that NASA will be forced to only fund one new planetary mission this year rather than the hoped-for two. Forced to delay its launch because its primary instrument, built by the French, would not be ready for its 2016 launch, NASA has decided to go on with the InSight Mars mission, rescheduling it for a May 2018 launch, rather than cancelling it outright. The seismometer, built by the French space agency CNES, will be repaired in time to make the 2018 launch window, said Jim Green, the head of NASA’s planetary sciences division in Washington DC. “That’s terrific news,” he told a planetary sciences advisory panel on 9 March. The Jet Propulsion Laboratory in Pasadena, California, will assume responsibility for building a new vacuum enclosure for the seismometer. The last sentence above suggests that NASA has decided to take certain responsibilities from the French to make sure they get done right. It also means that the cost will be born by the NASA’s planetary program, cutting into other possible future missions. The head of France’s space agency announced today that repairs to their instrument for NASA’s InSight Mars lander will be completed in time to ship the instrument to the U.S. in time for the scheduled March launch. Briefing reporters here at the COP21 United Nations Climate Change Conference, Jean-Yves Le Gall said the leak, which compromised the required high-precision vacuum chamber carrying InSight sensors, was caused by a defective weld that is applied to close off the tank. The leak’s cause has been identified and a new weld performed, Le Gall said. Tests to confirm the new weld’s integrity are underway and, assuming no problems, will be completed in time to ship the instrument to the United States in the first week of January. It will then be integrated into the InSight lander in preparation for the March launch. NASA Mars lander might miss 2016 launch window. A leaking French instrument planned for NASA’s next Martian lander, InSight, might force the spacecraft to miss its launch window next March. The instrument is still in France. If they can’t get the problem solved they can’t install it on the spacecraft. With a launch window only four months away time is running out. The competition heats up: When it launches its next Mars mission, a stationary lander, NASA will piggyback two cubesats, designed to fly past Mars and relay communications during the landing. As I’ve noted earlier, standardized small cubesats are the future of unmanned satellite operations. Expect them to increasingly replace all types of larger satellites. And because they are small and cheap (both to make and launch), expect them to lead to a burst of new capitalistic activity in space. Update: In related news, a small private company has delivered to NASA the first thrusters designed for cubesats. Up until now, cubesats have not been maneuverable. These thrusters will change that. 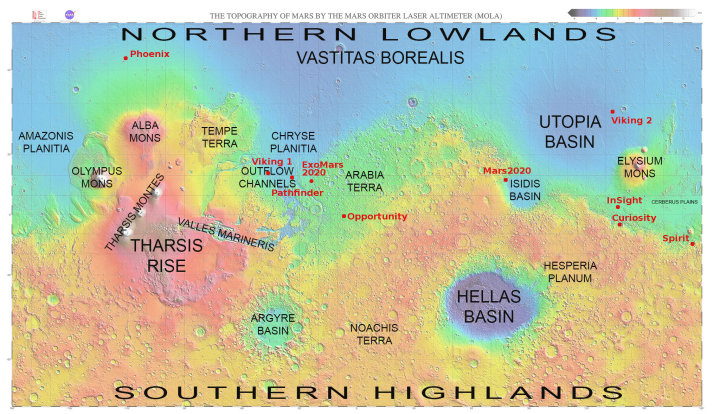 NASA scientists have chosen a specific region of Mars, Elysium Planitia, to land its next Mars science probe. Construction has now begun on NASA’s next Mars lander. Construction has now begun on NASA’s next Mars lander, set for launch in 2016.